An entrepreneur whose rugby aspirations were dulled but not defeated by a training injury is redirecting his passion for sport into an innovative new venture. Former Blaydon fullback, Ben Sengi, saw his rugby career come to an abrupt end in a training incident which damaged his anterior cruciate ligament in his knee. But he is now putting his love of sport to good effect by developing an app which will provide a host of sports teams and clubs with a cost-effective digital alternative to printed programmes. He and his colleagues at Sideline hope to pitch the app to FIFA World Cup organisers so it can be used by football fans at the 2022 World Cup in Qatar. With the help of Business Durham, the economic development organisation for County Durham working on behalf of Durham County Council, Ben is working on a prototype with Spennymoor Town Football Club. 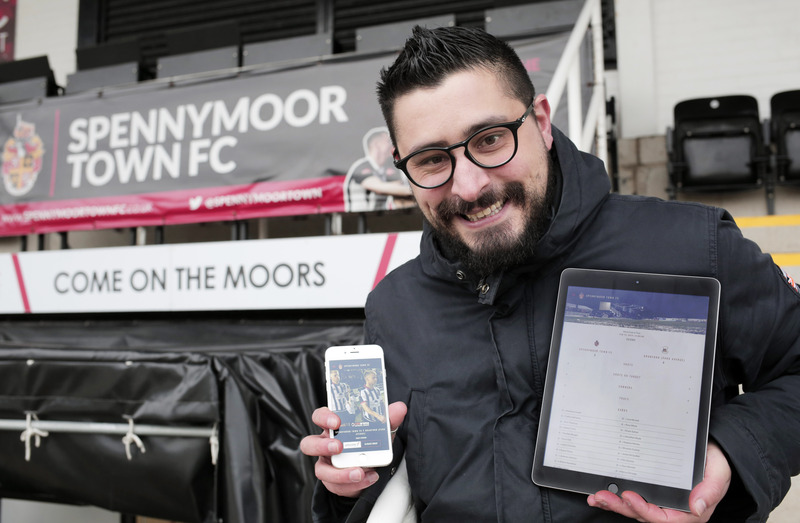 The interactive app, which can be downloaded to PCs, tablets and smartphones, is every fan’s dream, allowing them access to a wealth of information on their favourite club, including live-streaming of video and radio commentary. Currently in its test stage, the fan app offers up-to-the-minute news of the league and club, pre and post-match reports, alerts to goals and final scores, as well as red and yellow cards, team line-ups and player profiles, match statistics, match official details, fixtures and results, ad space with click-through to sponsors’ sites, the club shop and merchandise. All features will be available via Google Play and the AppStore. Long-term, the plan is to approach FIFA and to use the app for all ticket holders going to the 2022 World Cup in Qatar, where they will be able to use it for entry to games and to book recommended flights, hotels and restaurants. “The aim is to develop a solution which, within one app, allows fans to have all aspects of the event at their fingertips – travel, accommodation and access to the games,” said Ben, of Consett. “Playing rugby was a massive part of my life for more than 20 years and not playing anymore left a hole. Oddly, writing code and designing digital products has filled that gap. I’ve always wanted to merge my passion for sport with my love of technology. “I was originally inspired to develop the app after listening to a slot on Talk Sport’s Drive Section with Adrian Durham and Darren Gough. They were speaking to an EFL Club about the losses they were making on surplus printed programmes. At the time, I was developing a product that could have helped solve that problem. “After contacting Durham County Council, Business Durham introduced me to the MD of Spennymoor Town FC, Tony Wilson, who agreed to help with field tests. The club and the fans have been brilliant. They have already offered some valuable ideas to make the product better, which are now in place. Business Durham managing director, Brian Archer, said: “Sideline is just the sort of venture we are thrilled to help with our established network of partners, such as Spennymoor Town FC. The Sideline website can be found at https://sidelineapp.io and the app is expected to be launched in the next few weeks. Ben said: “We would love to talk to anyone about a solution we could deliver for their forthcoming season as well as sports clubs which require this type of media?